As is often the case when the jobs number is released, my plan was to sit down and carve out some time to put into context for this blog the latest U.S. monthly employment situation report. After pouring over the data in this latest release, looking at the trends, and digesting the report against history and other current labor market indicators, the narrative became clear. Then, on Monday morning I came across Barry Ritholtz’s piece, which captured so nicely the tone I wished to convey that I dropped my pen (err … took my fingers off the keys) and decided to share his article instead. It is very good. The reaction after May’s disappointing jobs report was predictable: The candidates babbled, markets trembled and expectations that the Federal Reserve would raise rates this month or next was suddenly off the table. All of this because the net increase in a group of more than 150 million employed people was 0.02533 percent versus analysts’ estimates of 0.10533 percent. That’s before we account for either 35,000 workers out on strike (0.02333 percent) or the margin of error of 100,000 (0.06667 percent). I have discussed the problems of trying to model the economy in real time too many times to detail here. But let’s not look at the employment situation. Instead, let’s consider some data involving actual dollars. I was reminded of this by a recent article that noted that tax data show that the job market is getting better, not worse. This is a compelling line of thought, based on taxes withheld from payrolls. This data is from the Bureau of the Fiscal Service of the Treasury Department, which releases daily information on collected receipts. What we see here isn’t consistent with the idea that employment growth is slowing, and instead suggests a modestly expanding labor market. A few caveats: First, this data isn’t seasonally adjusted; that means there are calendar effects, such as seasonality, annual or quarterly bonuses, and other issues that can skew it. Second, data on withheld taxes tells us little about the quality of those jobs being created. Last, tax cuts and increases also affect the numbers. But it is hard data. The site Daily Jobs Update, run by Matt Trivisonno, tracks Treasury’s daily withheld tax revenue. Have a look at the chart created by the site showing monthly changes. It indicates a steady improvement during the past three months, and strong gains year over year. Note this is cumulative, so it benefits from prior monthly gains in employment. The second chart is a plot of the annual growth rate of withholding-tax collections (red line) with a 21-day moving average (blue line). Second, 4 percent growth is still growth that, as Trivisonno notes, counts for a lot in a low-inflation environment. The key takeaway is that last month’s nonfarm payroll gain of 38,000 was a noisy number, likely affected by one-time events. It may also have simply been one of those months when the model generated a weak reading. 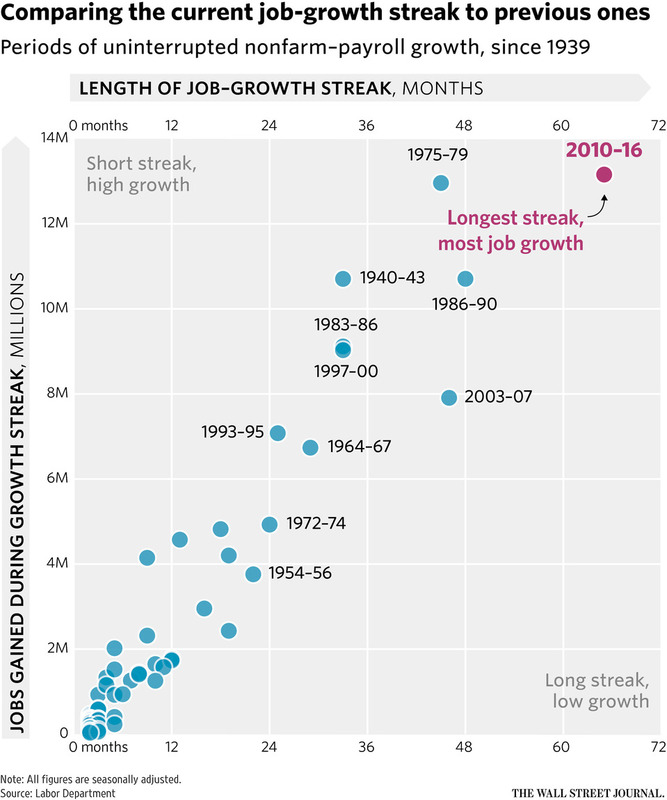 This month may be the opposite, with a large number of new jobs. If that happens, it might be equally misleading. The bottom line is that it is premature to declare this economic expansion dead, and a recession imminent. As the data on tax withholding suggest, the economy is still expanding at a good clip. Jason here, what Mr. Ritholtz is basically saying is that the labor market is nowhere near the stinker that the report’s headline, the pundits, or the financial markets all suggested it to be. And while my breath was certainly taken away for a moment at 6:30AM (MST) last Friday when the number crossed the tape, after further analysis in the hours and days since I tend to agree with his take. The report contained a lot of noise; there was much to unpack; and it simply did not jive with other firm indicators of the labor market’s strength – notably initial claims JOLTs, wages, and investment plans (which includes human capital). It is also noteworthy to consider the historic string of durable job growth that the American economy has enjoyed in this contemporary recovery. It is not unusual, in fact it is an expansion norm, to see soft months – what I refer to as growth “speed bumps” – along the way. Keeping that perspective in mind is good practice when assessing economic conditions. Bottom line: the jobs report headline was indeed like a cold splash of water, but I urge caution in taking it at face value drawing broader dour economic inferences from it.